Plans to transform the Loyola Chapel into a community space are nearly finished and students’ hands are covered in dirt, having worked the herbal sprouts of RealiTea, the clean rows of Loyola Farms and the People’s Potato Garden. High above the scurrying on the ground, another project is being added to the list: green roofs. “We have a real groundswell of demand for hands-on learning in terms of sustainability solutions and green roofs could be a part of that,” said Alex Oster, a former Concordia Student Union VP Sustainability and Projects who is now working in the Dean of Students office. 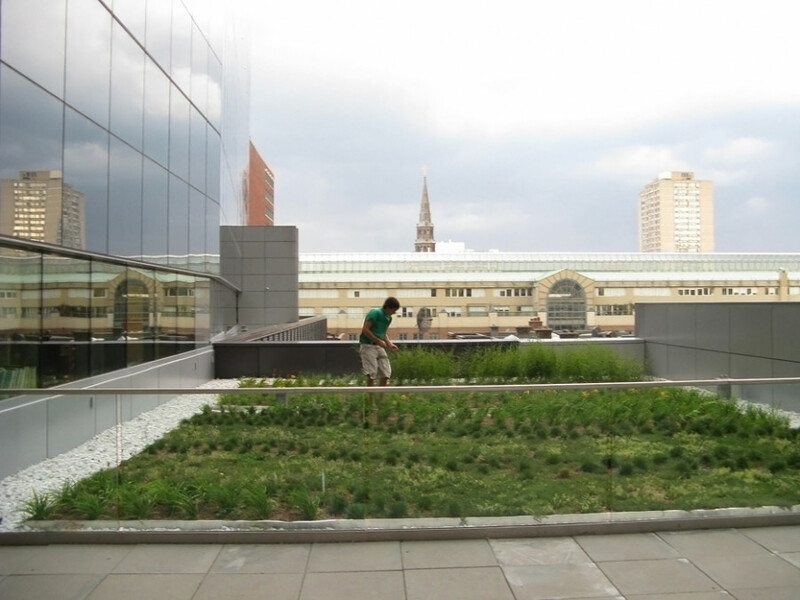 Oster is hoping for the green roofs project to have at least three roofs at Loyola Campus evaluated by a structural engineer by the end of the year. If he has his way, plants could be budding atop the Centre Building (CC), Campus Centre (SC) and Science Complex (SP) by next year. “I heard that the chapel had applied for sustainability action funding and part of that was for the greening of the chapel, but it was vague. So I went to the rooftop of the chapel and thought, if money is set aside, we can start a garden up there,” he said. With representatives from facilities management at Loyola, the public safety office and security, Oster went to the rooftop. If he was going to get his project approved by the university, those were the people he would have to convince. What initially started as a project on the chapel roof has now moved to three other buildings. Oster hopes to have at least five examined. One of the biggest possible expenses would be the need to structurally reinforce roofs to take the added load. To avoid the expense, Oster is only eyeing newer buildings on the antiquated campus. Although Oster is heading the project, the work is being done through a collaborative model that has involved two classes: URBS 438 Urban Ecology and ENCS 392 Impacts of Technology. The project used students with strong backgrounds in engineering, geography and urban planning. With the multidisciplinary team in place, students would look at the problem and attempt to solve it using their theoretical knowledge and hands-on work to better the campus. The urban ecology class will index the size of the roof and plot possible uses while the engineering class will tackle the larger structural issues. There is a possibility that design students will be added later to help integrate the look of security measures into the roofs. To cover the cost of the feasibility study, Oster applied for money from the Sustainability Action Fund, a student and university-funded sustainability incubator. While Oster was honest about his chances of getting the money—“You never know,” said the former VP—other sustainability advocates have emerged as supporters of the greening initiative. “The project has successfully managed to create interest at the administrative level and it is indicative of a well-defined idea,” said Pawel Porowski, the external communications co-ordinator for Sustainable Concordia. “He has managed to garner support from faculty and students. While he is cautious about being specific about the project’s timetable before it gets funding, Oster was confident in the case he had prepared for Concordia’s administration. Apart from saving money for the university and creating new spaces for students to study and mingle, Oster said the green roofs could become a critical component in the education of sustainable citizens. “We are three generations removed from a society that was 80 per cent yeomen farmers. All of a sudden, in 70 to 80 years, we have gone from the majority of people growing food to almost nobody,” he said. “If you are looking at long-term solutions to our industrialization of food, people will need to augment their consumption of food through personal production.